Security Benefit Group’s corporate headquarters desperately needed a refresh. The flooring and finishes were originally designed to be reminiscent of a cruise ship. The look of the space was dated and no longer matched the company’s image. 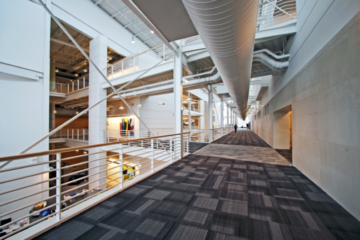 Security Benefit Group worked with Image Flooring LLC to replace thousands of square feet of carpet throughout the expansive building in Topeka, Kansas. 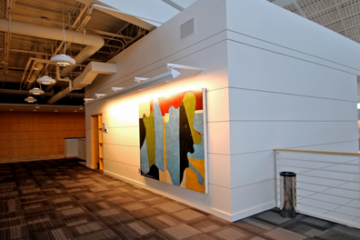 Time was of the essence, as the office remained open throughout the entire removal and installation. However, thanks to Image Flooring’s extensive training and certification as an INSTALL Warranty Contractor, the process was smooth and straightforward. 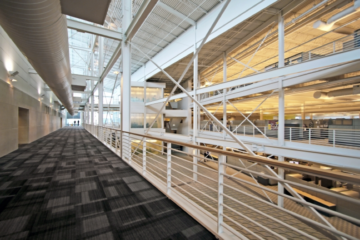 The Security Benefit Group project caused a bit of déjà vu for Image Flooring, as the flooring contractor installed the original carpet tiles twelve years prior. When the owner came to the Image Flooring team with an idea for updated finishes in the common corridors and executive areas, they knew exactly what the space needed. 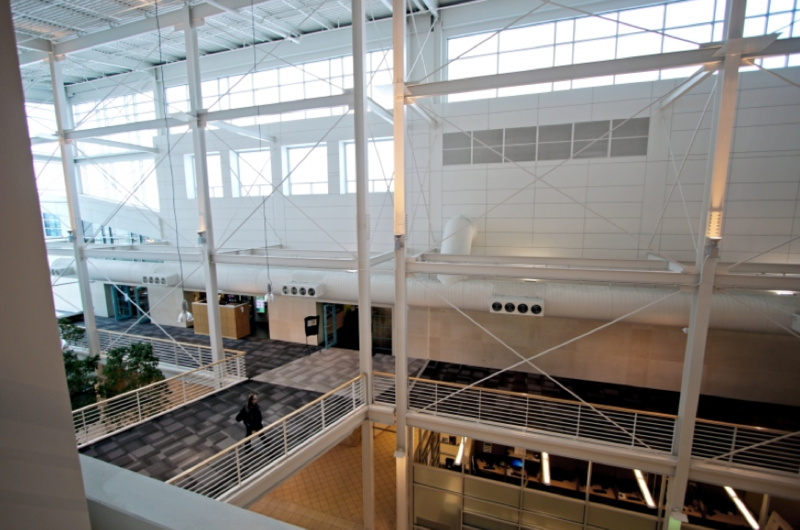 Refreshing the space would help attract and retain employees, match the new direction of the company and create a complementary aesthetic for the modern architecture of the building. 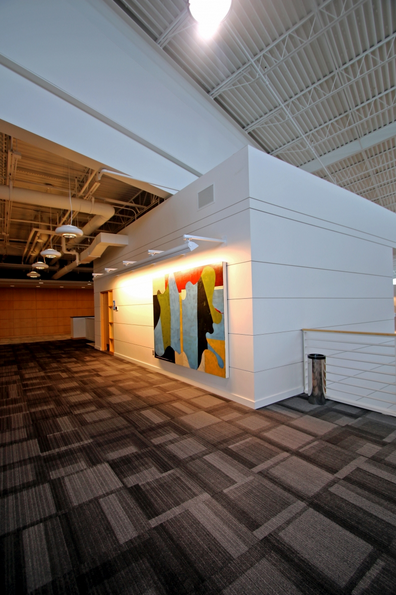 Image Flooring’s 12-year relationship with the company proved valuable for navigating space and project challenges. From original installation, through a decade of occasional repair and patch projects, installers had an established a relationship with the facility management team. The primary challenge was working around the operating schedule of the company. Typically, floorcovering installers have to be mindful of other trades, carefully scheduling jobs around key milestones. With the Security Benefit Group project, the team also had to anticipate the impact of the end-user being present during the renovation. Installers were careful and observant of the folks who worked at headquarters. Extreme caution was used to alert them of potential dangers, specifically in the corridors that were completed in two phases. Keeping the walkways partially open with phased installation was a challenge. In an age when many of us are buried in our smartphones, it’s easy to miss signage and warnings. 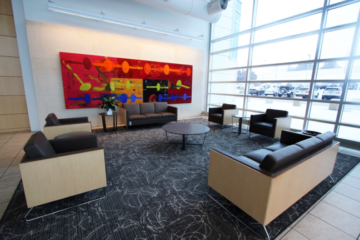 In addition to carpet tiles installed throughout the walkways and high-traffic areas, area rugs adorned select waiting spaces. These covered the existing tile floors. 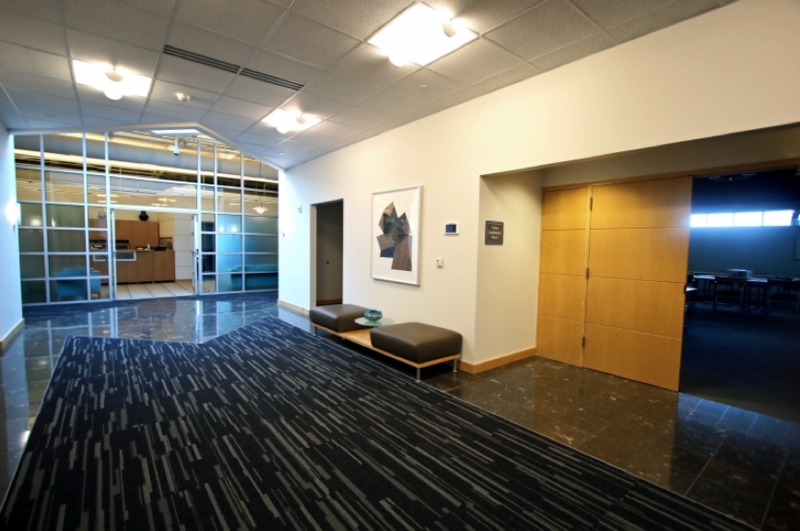 Inset carpet on the executive level was also replaced to provide a more cohesive look and feel that matched the contemporary gray color palette found throughout the building. The refreshed Security Benefit Group headquarters exemplifies the power flooring has to change the look and feel of a space. Nothing else was rehabbed in this renovation project, yet the building has a new energy and feels modern, fresh and reinvigorated. 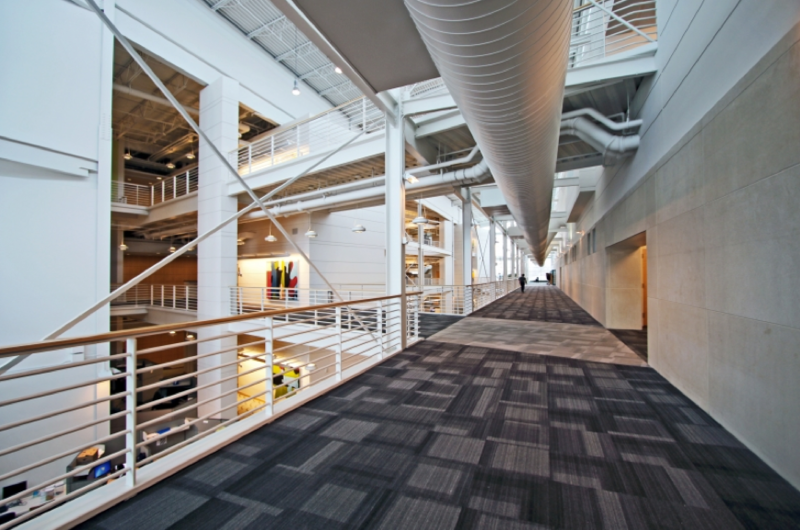 The essence of the building remains as well – a benefit to Image Flooring, which is working with the company to replace wavy carpet on the first floor that emulates the ocean but feels out of place. The design and installation teams look forward to creating a new look and feel for this space that mimics the ocean without being so literal.